The women that play roller derby are complex creatures. 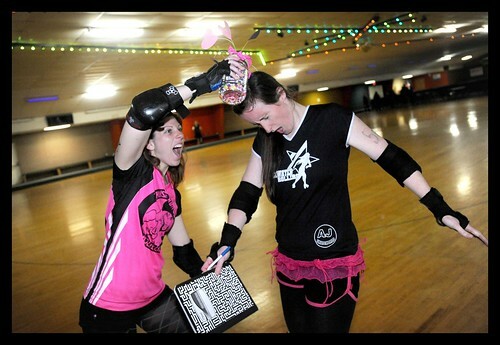 These women live dual lives, their regular life and their derby life. For fans that wonder about the women who decide to go and battle on the track for fun, this column is for you. I find the whole idea of a derby persona fascinating. Let’s use myself as an example: when I lace up my skates I am no longer Kim, wife or mom. I am Fly Swatta, or as my teammates refer to me, just Fly. In the derby world, skaters rarely know the real names of their opponents. I thought it would be fun to interview the women voted most valuable player at the end of every bout. Now I’m not going to give away their true identity, but I will hopefully be able to give you some fun little tidbits about the women that rock the track. 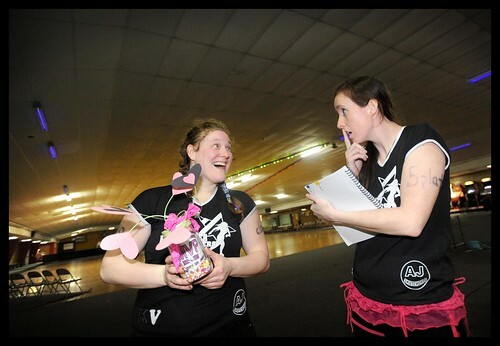 On February 12th the Blackwater Rollers took on New River Valley and at the end of the bout each team voted for an opposing player that really shined, and named her MVP. The first lady I had the pleasure of interviewing is Chatter box of NRV. If you attended the bout and saw her performance I am sure it is hard to believe this was her first time being voted MVP. Chatterbox has been playing derby for two and a half years. The second gal from BWR is the one and only Eartha Hitt. BWR’s resident mixed martial artist and all around awesome chick has been with the team since September 2009. The following is my interview with these two amazing women to the best of my memory. Fly: What song gets you pumped before a bout? Fly: Have you ever hip checked someone outside of derby? Fly: If you could have a celebrity as a parent who would you pick? Fly: Are you a morning or night person? Fly: What is a song you are embarrassed to admit you like? Fly: What is your favorite cartoon? Fly: What teammate are you closest to?